an estimate of the proportion of the population that dies during a specified period, usually a year; the numerator is the number of people dying, the denominator is the number in the population, usually an estimate of the number at the midperiod. The ratio of total deaths to total population in a specified community or area over a specified period of time. The death rate is often expressed as the number of deaths per 1,000 of the population per year. Also called fatality rate. 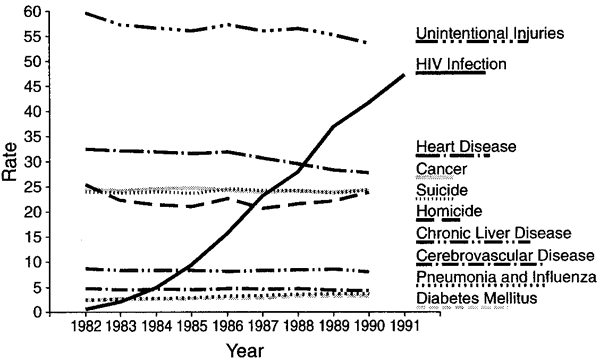 the number of deaths occurring within a specified population during a particular period, usually expressed in terms of deaths per 1000 persons per year. Synonym(s): mortality rate, mortality (2) . The ratio of the number of deaths to the total of the population concerned. This analysis combined findings from eight HIV study groups (cohorts) in Europe and the United States that had data necessary for an analysis of how smoking affects death rates in people with HIV. The biggest fall is projected to be in ovarian cancer, with death rates dropping by 43%. Rwanda, according to the World Health Organisation, has a death rate of 1,427 per 100,000 population. Hospitals with the fewest senior doctors on duty have the highest death rates, reflecting prior concerns about a lack of consultant cover. Since the decade of 1920-29, the death rate has fallen by 99. The jurisdictions with the highest age adjusted 2009 death rates are mostly in or near the Southeast. According to background information in the article, the majority of studies of eating disorder-related death rates focus on AN. Individuals with blood-sugar levels between 126 mg/dL and 180 mg/dL had a death rate of 18%, while the death rate for those with blood sugar over 180 mg/dL was 31 %. And the region worsthit by the illness remains the North East where the death rate is 89. 5% in the fifth of hospitals with the lowest risk-adjusted death rate to 6.